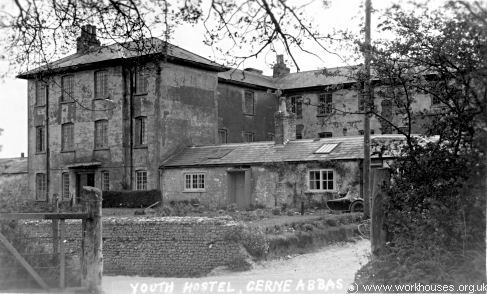 Prior to 1834, there was a parish workhouse in Cerne Abbas on Bridge Street. County of Dorset: Alton Pancras, Batcombe, Buckland Newton, Cattistock, Cerne Abbas (2), Nether Cerne, Up Cerne, Chesilborne, Frome St Quintin, Godmanston, Hermitage, Hilfield, Mappowder, Melbury Bubb, Melcombe Horsey, Mintern Magna, Piddletrenthide, Pulham, Sydling St Nicholas, Wootton Glanville. The population falling within the union at the 1831 census had been 6,763 with parishes ranging in size from Nether Cerne (population 83) to Cerne Abbas (1,209). The average annual poor-rate expenditure for the period 1833-35 had been £3,472 or 10s.3d. per head of the population. 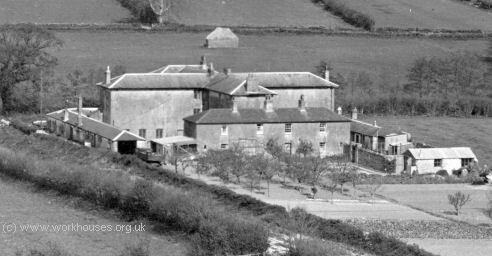 The Cerne Union workhouse was built in 1836-7 at a site on the west side of the Sherborne Road the north of Cerne Abbas. The Poor Law Commissioners authorised an expenditure of £2,700 on construction of the building which was to accommodate 130 inmates. It was designed Charles Wallis and followed the model "200-pauper" cruciform layout published by the Commissioners in 1836. In around 1841, following an outbreak of typhus fever, a separate isolation block was added to the rear of the main building. The workhouse location and layout are shown on the OS map of 1889. An entrance and administration block at the front of the building contained a porter's room and office on the ground floor with a board-room and Clerk's office above. At the centre rear of the entrance block was the chapel. Cerne from the north-east, 1930s?. The rear wings contained day-rooms and kitchen on the ground floor with bedrooms and sick-rooms on the upper floors. The entrance block and cross-wings were of three storeys in height with single storey blocks forming the perimeter. Cerne from the west, 1930s?. The workhouse inmates worked in gardens, fields and workshops and were paid in special tokens which could be redeemed at local village shops. 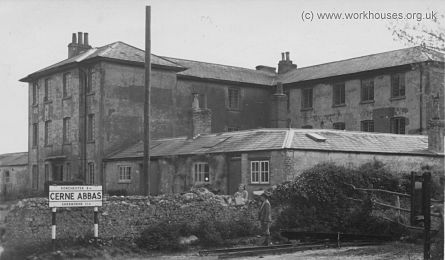 From 1932 to 1955, the former workhouse site was used as a youth hostel. During the Second World War it housed evacuees from a London school. The building was later converted into flats known as Giant View after the nearby hillside figure carved in chalk. Much of the building survives but is now rather altered with the single storey blocks extended to two storeys. 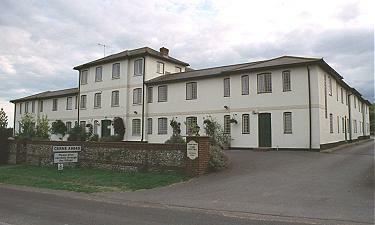 The site is now used as a geriatric care home. Cerne, rear of main building from the north-east, 2000. Cerne from the west, 2000. Dorset History Centre, Bridport Road, Dorchester DT1 1RP. Relatively few records survive - holdings include Guardians' minute books (1835-1925); Plan of workhouse (1836); Assessment committee minutes (1923-27); etc. The Cerne Abbas Union Workhouse 1835-8 by Elizabeth O Cockburn (in Proceedings of the Dorset Natural History and Archaeological Society, 94, 1972).